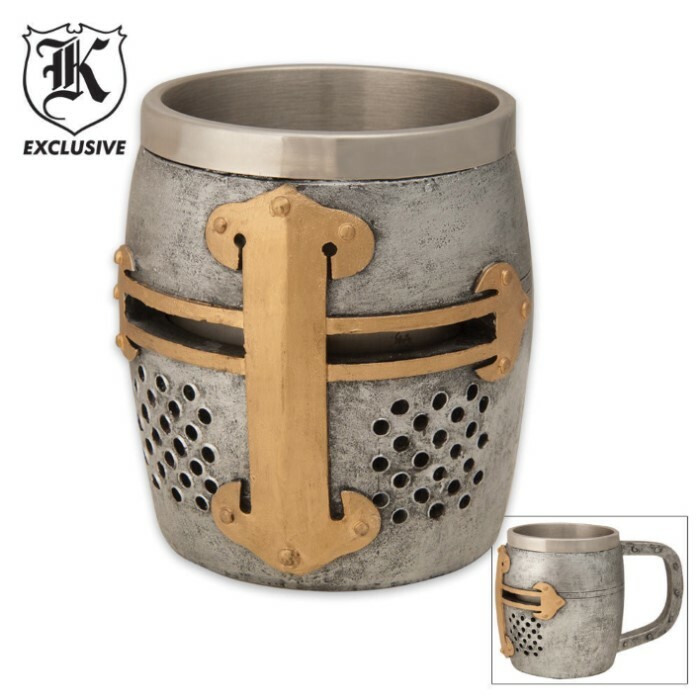 Enjoy your beverage in this Medieval mug! This unique drinking mug features an intricate helmet design and can be used with both hot and cold beverages. The stainless steel inner liner helps to maintain your drinks temperature. Measures 4 1/4 in. tall x 7 in. wide and 3 1/4 in. in diameter. Made of cold cast resin. After receiving this mug as a gift, I can personally say, it's my favorite mug I've ever owned. but after a few days of use, I noticed water leaking out around the edge where the Stainless steel and cast resin meet. I'm not sure if this is a known issue, or perhaps mine is just faulty. I don't plan on returning my mug or anything, I'm still happy with it, just thought it be nice for others to know before buying. Response: Thank you for informing us of that! We will most definitely look into this. I was surprised to see the detail and craftsmanship of this product. I will vehemently recommend this product to anyone. I am adamant about this. I bought two of these as gifts for Christmas. A very cool mug. Both recipients loved it. Not microwave safe,... ha!